Mojo Monkey Donuts: Make Mojo Monkey Donuts the Best in the Twin Cities! Make Mojo Monkey Donuts the Best in the Twin Cities! Want to share your love of Mojo Monkey Donuts with the world? 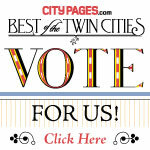 Please vote for us in the City Pages' Best of Twin Cities poll: #70 is Best Doughnuts! Enter Mojo Monkey Donuts as the Twin Cities Best Doughnuts! If we win, we'll give away a delicious treat to everyone who voted! Thank you for your support! Just had my first donut this morning! It was absolutely the best I think I've ever had. You certainly get my vote!